Wonderful news! Added sound mod by kriechbaum to XBS's great DAF F241 truck mod! He found a great video and he made the interior of the sound only. He plan to make the exterior based on the interior with some tweaks but this needs time. He spent the whole day on this wip sound. He decided to share with you for the first time a sound that is not finished. He hope you will enjoy it. He have added a little more of torque on the 3600 – 3300 engines because sometimes in the game it’s very hard to play with them with the heavy haulages. Reminder: This sound mod is still in beta. 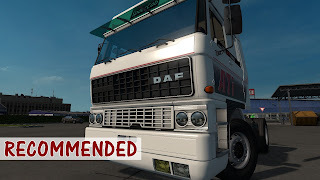 You need DAF F241 truck mod to use this sound mod. You can download here XBS's truck mod.